Both the bridle fit itself, and the actual way you put the bridle on the horse if understood properly can allow your work to progress smoothly and do a lot for your relationship with your horse. You can actually learn a lot about your horse's character and his confidence from his reaction to tack. It is well worth teaching yourself how to do it patiently and sensitively, because it is part of the foundation for your mounted work as well as being an opportunity to bond more with your horse. 1) In terms of overall 'bridle fit' importance, it is probably the fitting of the noseband which needs most attention and understanding. In a way, how you fit this one buckle is a reflection on your whole philosophy of training: basically whether your training is about trying to cover up problems, or getting to the bottom of them and finding a way to resolving them. Doing the noseband up tightly to prevent resistance in the jaw is - as in most incidences where the philosophy is flawed - going to create the very problem it is supposed to prevent. It is in fact a good way of giving the horse a problem in his mouth, making it difficult, if not impossible, for him to relax his jaw and accept the bit. Imagine the anxiety of feeling like you couldn't swallow or even cough unhindered. In fact a horse must have some freedom with his jaw to allow him to accept the bit properly, when the jaw relaxes it opens slightly and the horse must feel encouraged to do this, with a nice, loose cavesson noseband. Make sure you can get three fingers in easily. Calm, well-adjusted horses, properly introduced to the bit and without physical problems, will accept the bit gradually and straight-forwardly as a result of their correct training. If they do develop a mouth issue, you want to know about it straight away because it is a symptom of pain or discomfort or fear either in the mouth directly or from some related source. Sharp teeth causing damage or ulceration of the inner cheeks which makes the horse unhappy in general and unlikely to relax the jaw easily. Wolf teeth making the bit sit uncomfortably on one side or the other or both. Spinal problems in the back or neck, joint problems, or pain from any source can be expressed by the horse in his mouth, often by grinding teeth. Note: grinding teeth can be an expression of extreme concentration and effort. Discomfort which arises from changing muscle memory and working hard must be worked through . As a rider, assuming that you have the right intentions for your horse's well being, it is important to trust your intuition about such things. Discomfort caused by the bit itself can be a source of resistance. 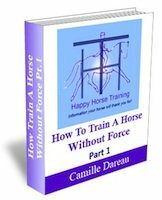 Go to How To Fit A Horse's Bit for more information. As for flash, drop, kineton, grackle, and other variations of noseband, they really have no genuine place in correct training and everyone will be happier if they go in the dustbin, along with draw reins and other gadgets or so-called 'training aids'. 2) The height of the bit is also very important to bridle fit, so make sure if you're buying a bridle that you get the right size. They vary quite a lot, and so do the size of horses' heads! 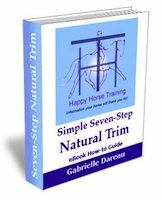 Go to How To Fit A Horse's Bit for more information. 3) For good bridle fit the looseness of the throat latch is another concern. Even if there is not necessarily a definite physical effect from tight straps, like tight clothes, it is something that your horse will be aware of. The nerves of the head are numerous and sensitive, so have the throat latch nice and loose so there isn't even the hint of restriction of the throat. You want to be able to get your whole fist in easily. 4) Often neglected, make sure the brow-band is is long enough. If it isn't, the headpiece will be stuck into the back of the horses ears and he will feel it pinching there. The ears are very mobile and it is always better to make sure all parts of the horses sensory-perception system are unhindered. Otherwise it can become a source of anxiety. 5) A less obvious element of bridle fit, and they are not always easy to find, but make sure that your reins are long enough so that when you let your horse out on a loose rein he can fully stretch his neck down without any hindrance from the reins (this should always be done at frequent intervals during any riding session - even out hacking - to give the neck-muscles a chance to rest, as well, of course, as at the beginning and end of your session). 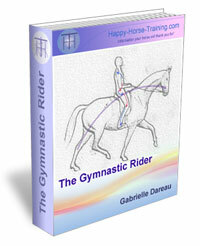 You shouldn't have to extend your arms forwards to allow the horse to stretch due to reins that are too short.